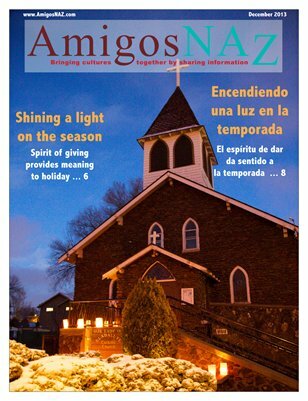 The December 2013 bilingual edition of AmigosNAZ opens with a cover story on the spirit of giving in Northern Arizona with a variety of charitable groups seeking to help those in need this holiday season. The edition also includes a commentary of upcoming holiday events in the region; a preview of the Dec. 10 Sedona City Council meeting where officials will discuss supporting a comprehensive immigration reform resolution; a listing of upcoming meetings in the region; a travel story by writer Stacey Wittig on holiday celebration plans at the historic Taos Pueblo; food safety tips by the Coconino County Health Services District; information on the Health Insurance Marketplace by North Country Health Care; tips on roof repairs this winter; resolution ideas for children; budget suggestions for this holiday season and tips on how to host a memorable holiday party. All this and more brought to you by AmigosNAZ — Providing information for and about the vibrant Latino community in Northern Arizona.